This is the sort of cake you'd want to eat the whole of when you'd been chucked. Preheat the oven to 180°C/160°C Fan/gas mark 4/350ºF. Butter and line the bottom of two 20cm / 8 inch sandwich tins. In a large bowl, mix together the flour, sugars, cocoa, baking powder, bicarb and salt. In another bowl or wide-necked measuring jug whisk together the eggs, sour cream and vanilla until blended. Using a freestanding or handheld electric mixer, beat together the melted butter and corn oil until just blended (you'll need another large bowl for this if using the hand whisk; the freestanding mixer comes with its own bowl), then beat in the water. Add the dry ingredients all at once and mix together on a slow speed. Add the egg mixture, and mix again until everything is blended and then pour into the prepared tins. And actually, you could easily do this manually; I just like my toys and find the KitchenAid a comforting presence in itself. 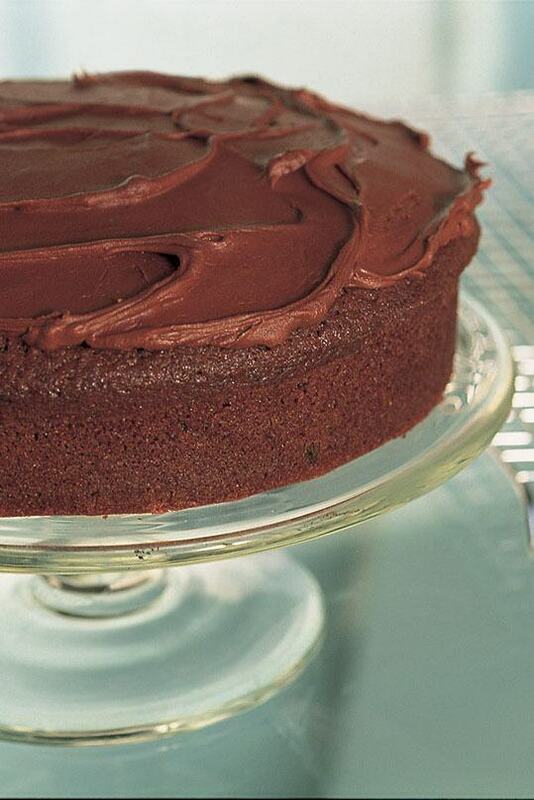 Bake the cakes for 50-55 minutes, or until a cake-tester comes out clean. Cool the cakes in their tins on a wire rack for 15 minutes, and then turn the cakes out onto the rack to cool completely. To make the icing, melt the chocolate in the microwave - 2-3 minutes on medium should do it - or in a bowl sitting over a pan of simmering water, and let cool slightly. In another bowl beat the butter until it's soft and creamy (again, I use the KitchenAid here) and then add the sieved icing sugar and beat again until everything's light and fluffy. I know sieving is a pain, the one job in the kitchen I really hate, but you have to do it or the icing will be unsoothingly lumpy. Then gently add the vanilla and chocolate and mix together until everything is glossy and smooth. Cover one of the cake halves with about a quarter of the icing (as in the photo), then top with the remaining half. Ice the top and sides of the sandwiched cake, too, spreading and smoothing with a rubber spatula.